Welcome to Adventure Island - The Next Generation website. John Michael Howson and Bruce Rowland have united again to bring Adventure Island - The Next Generation to the children of today. A mixture of pantomime, song and dance, Adventure Island - The Next Generation has all new stories and music, but still has the same sense of fun and core values of the original show. It has been released on DVD and live shows can be seen around Australia. 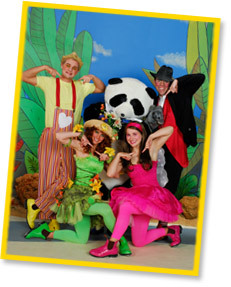 Entertain your kids these school holidays with an Adventure Island live show. Adventure Island is also available to preview and buy online from the products page. If you would like to stay informed about new shows, special offers and latest products be sure to join our mailing list! Check out the kids zone section for fun and exciting free activities for kids. Join the kids club to become an Adventure Islander and get access to competitions and heaps of fun stuff. Check out the new Learn to Sign with Bazza Bear interactive! is a perfect gift for kids! copy of the DVD today. Adventure Island - The Next Generation are currently rehearsing their new show "Lizzy's Birthday Surprise". Visit Live Shows for more information on live shows by Adventure Island.